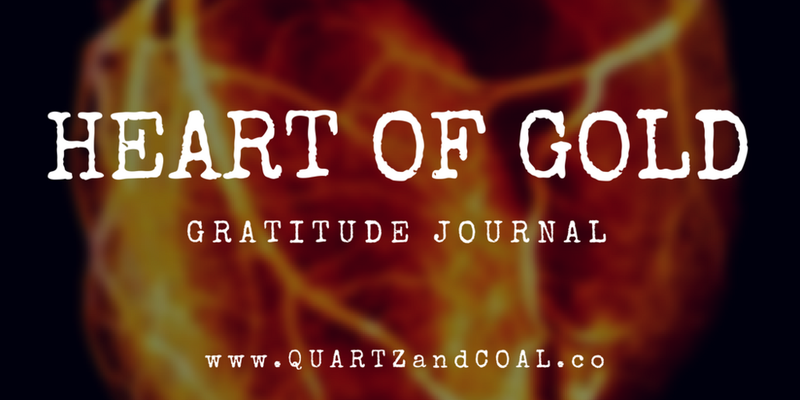 HEART of GOLD GRATITUDE JOURNAL! The Kickstarter campaign has launched, and it's time to raise money + awareness about the benefits of having a daily gratitude practice. This is a pre-sale opportunity for everyone interested in developing + growing the habit of appreciating the little things in life each day to feel more fulfilled + happy. Expressing gratitude about everything you have now, instead of constantly worrying about what you feel you are lacking is a huge step towards manifesting an intentional life. Get updates + snag EXCLUSIVE rewards! The Kickstarter went live at 12:01 am (EST) on September 9. For three weeks, everyone interested in purchasing a Gratitude Journal has the opportunity to buy one (or more) through the Kickstarter campaign pre-sale. Exclusive rewards are available to save you tons of money on journals simply by backing the campaign early or choosing to buy journals in bulk at a high reward tier. These journals will be finished + shipped early enough to be gifted this coming holiday season! Kickstarter is a crowdfunding platform where anyone with a dream can share their idea and people who think it's a good idea, can support them by pledging for rewards. Rewards vary from project to project, but for the Q+C Kickstarter, I am pre-selling 30 Day Gratitude Journals! There is an add-on merchandise stretch goal I'd be ecstatic to reach, but initially the goal of $3000 is set to print 250 journals. The more orders we get, the more cool stuff we'll be able to unlock to make this the coolest journal you can imagine with the possibility of including some awesome freebies too! No one is charged for their rewards until the very last day of the campaign, if the project goal is reached. You pay exactly what you pledge for the rewards + shipping fees included to insure your rewards will be mailed to you. Kickstarter's fee, credit card processing fees and taxes are taken out of the total amount raised. Supporting the project early gives you an advantage by insuring you lock into the exclusive, limited edition rewards tiers. I am offering a digital copy for $5 as a thank you to anyone who simply wants to support the project without getting a physical copy of the journal in the mail. The first 100 people to pledge for a journal get 30% off and save $3! (12) journals tier get 50% off, saving $70 off the retail price! Take advantage of this opportunity to save BIG! I don't wanna miss it -- send me Kickstarter updates! Why do you need $3000? Kickstarter a great way to get the word out about new products, but it doesn't work without the help of backers sharing about the amazing finds, awesome deals and cool projects these campaigns are making possible. Kickstarter campaigns take a tremendous amount of time to research, organize, promote and fulfill. Often times, project managers are raising money to make their dreams into a reality and they aren't even getting paid for it. When you are passionate about your work, you are willing to invest a tremendous amount of time into manifesting what you envision. I have been dreaming about making this journal into a one-of-a-kind printed book for over 10 years. It has evolved along with me over the last decade, becoming something as authentic + easy to use as possible. The process of developing a gratitude practice is a major component of living a more intentional life, while being more mindful about your surroundings. It helps you feel lighter, letting go of the worries, the judgment, the expectations and the negativity blocking you from embracing your true self to become the best version of yourself possible! With built in accountability pages, an online 30 Day Gratitude Challenge and a community of like-minded people working on being more grateful, tuning into the things you are grateful for has never been easier. This simple journal is small enough to take anywhere, and it's an amazing way to keep track + reflect back on everything you value in your life. Remind me about important Kickstarter news! Wanna help make the gratitude journal EXTRA AMAZING? Create an awesome cover design for the journal! Calling all artists--I need your help. Click here to get more details and to submit your artwork for a chance to see it printed on the gratitude journal! Share the campaign with your friends, family members and followers! Download the media kit for photos, details and even an email you can share with the people you are grateful for in your life. Click here to SUPPORT THE CAMPAIGN! Snag your favorite rewards and pick up a few extras--they make great gifts of gratitude for your favorite people!